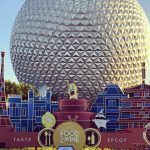 If you are lucky enough to visit Walt Disney World from now until the end of May, you’ll get treated to an immersive spring experience at Epcot’s International Flower & Garden Festival! I had the pleasure of visiting the festival with my four-year-old daughter this year, and I came away with the impression that Flower & Garden is a much more kid-friendly event that it’s autumn counterpart, Food & Wine. 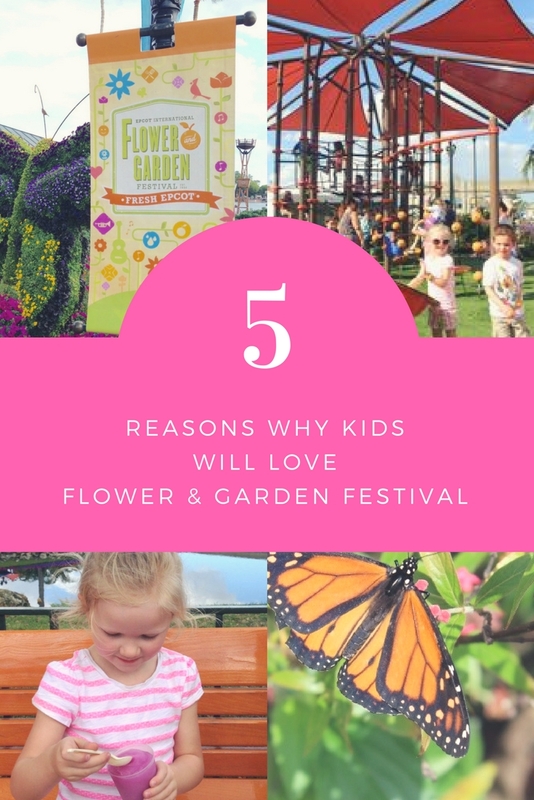 In this article, I’ll share five reasons why I think your kids (or grandkids) will love Flower & Garden Festival, and pass on some useful tips from our recent trip. 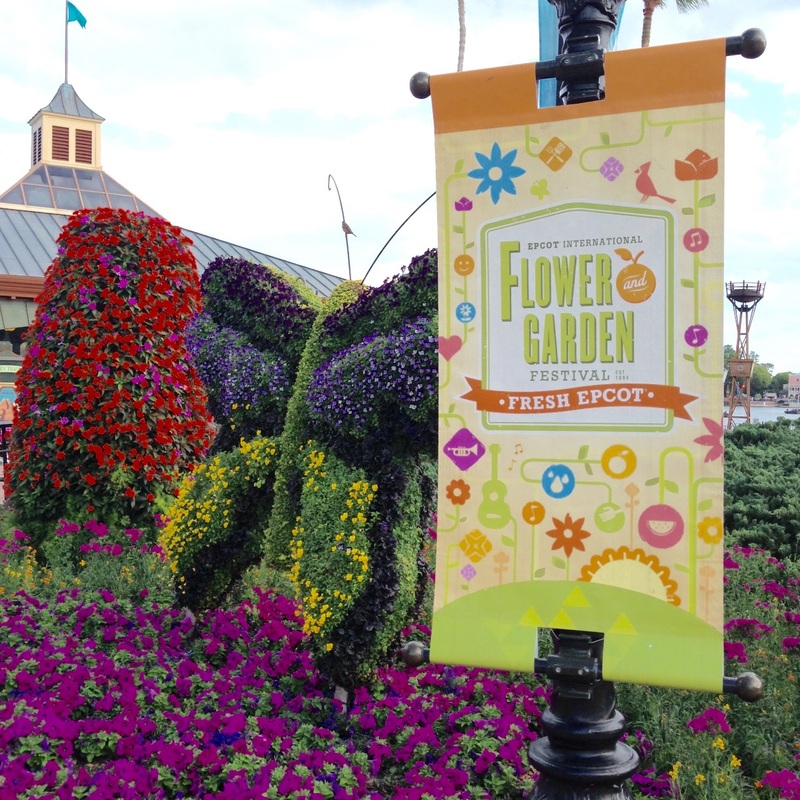 There’s not one, not two, but THREE play areas set up around Epcot just for Flower & Garden festival. All three are excellent, and will likely surpass anything you’d find at a neighborhood park. 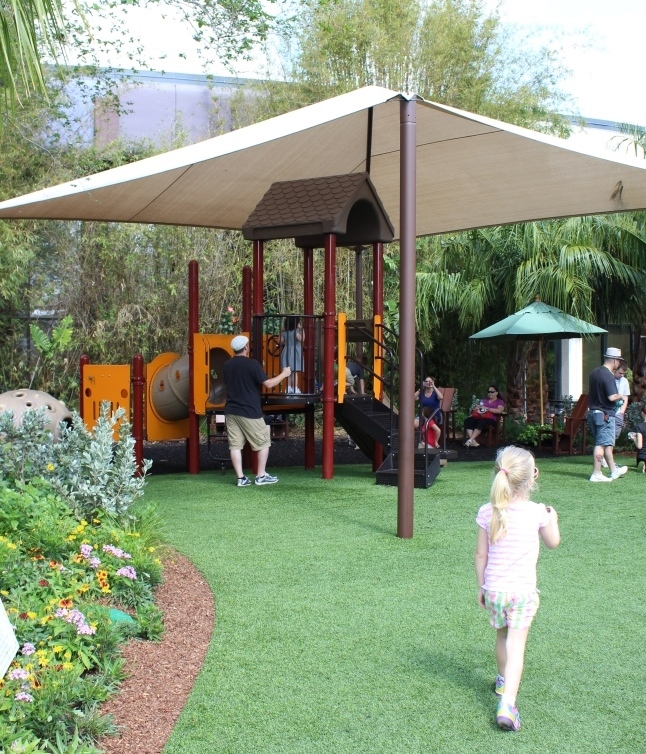 The largest one – Music Garden Melodies Playground – is found on the Imagination walkway that connects Future World and the World Showcase. It features hands-on music making play and even lights up after dark! There is plenty of shaded seating for adults (bless you, Disney) and lots for the kiddos to do. We spent over 45 minutes here and my daughter begged to stay longer. I saw kids from age one to twelve playing here and having a blast. Road to the Florida 500 is an interactive play area located near Test Track in Future World. It is smaller but really fun and is right next to the new Cars topiaries. This one closes at dusk. 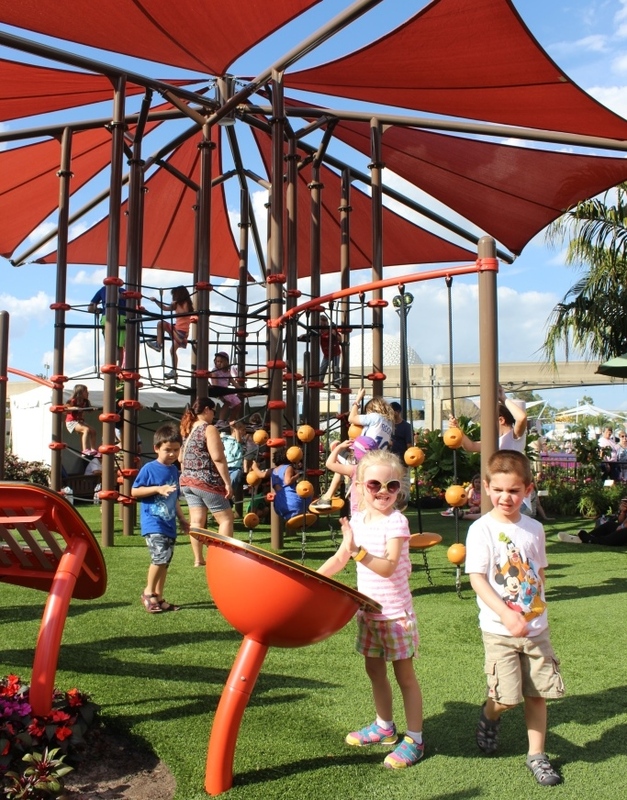 The smallest of the playgrounds is the Florida Fresh Garden & Backyard Habitat. 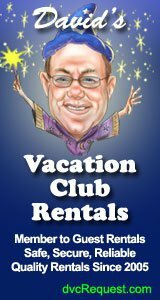 It is located between Morocco and France and is geared for a younger crowd, I’d say four and under. It is illuminated after dark. TIP: Kids will love the chance to let loose and have some unstructured time during the day. Just plan for a little down time for everyone, and be prepared for possibly having a hard time pulling them away! The “Butterflies on the Go” garden is found near the back of Innoventions West. 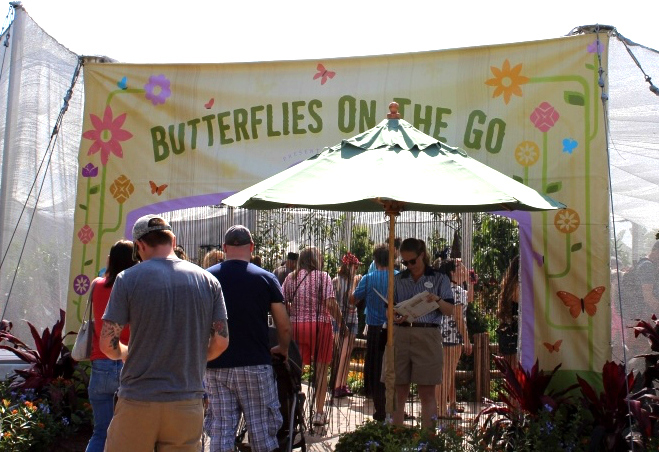 It’s a walk-through exhibit (strollers are allowed in) that is home to hundreds of butterflies and the plants they depend on for food. Kiddos love “hunting” for butterflies, and many adults love the chance to grab some gorgeous pictures of them. I’ve even turned pictures I’ve taken here into blank greeting cards once we were back home! TIP: There are some interactive features at just the right height for the little ones. They can learn about the butterfly life cycle and what different colors mean on butterfly wings. I suggest visiting the butterfly garden in the morning or evening, since the heat can be oppressive in the middle of the day. The Eggstravaganza Egg Hunt is a low-cost activity that has lots of kid appeal. 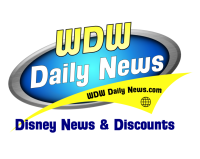 You can buy a map and sticker set at many places around Epcot for $5.99 (plus tax). 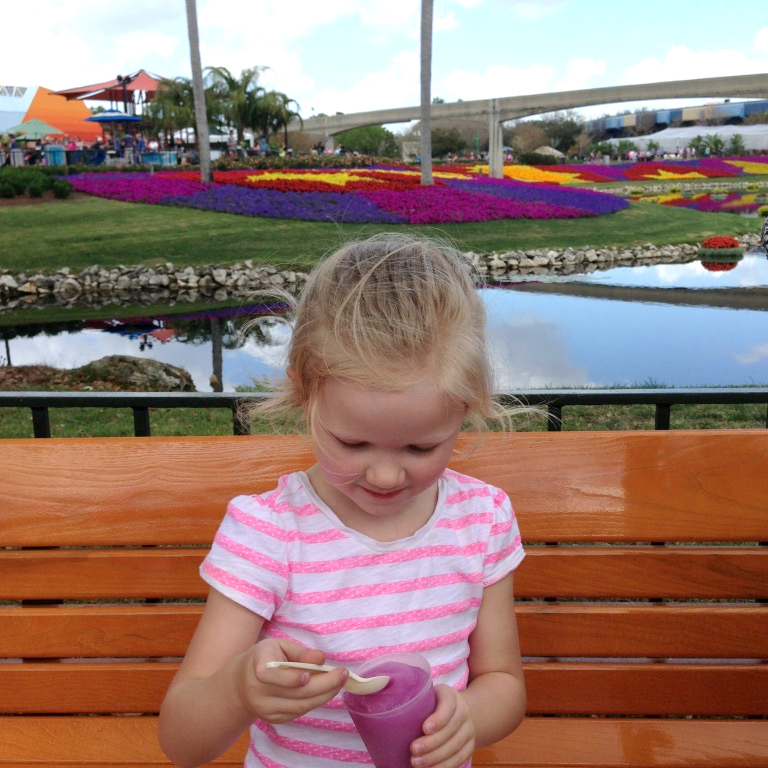 As you make your way around World Showcase, look for large eggs painted as a Disney characters hidden in each country. 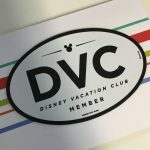 Place the stickers on the map and turn it in at the World Travelers store (found at the entrance to World Showcase) and you’ll get to pick a prize. 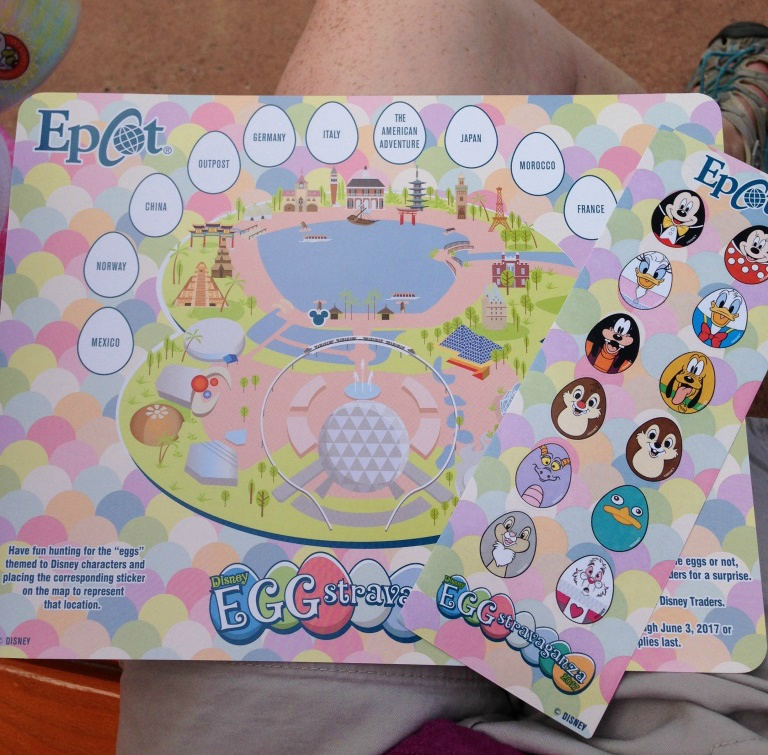 The map doesn’t even have to be filled in correctly, so if your kids lose interest half way through the day you can still get your prize (which is a small Disney character egg to take home). 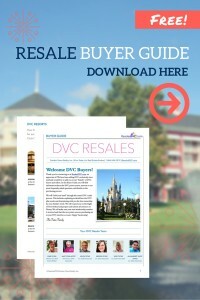 We found that cast members in the pavilions are happy to give you a clue and point you in the right direction. In years past the egg hunt was only available the week of Easter, but it is being offered throughout the entire festival this year! TIP: If they aren’t into the egg hunt, kids ages six and up might like to complete the Kidcot Garden Stop Field Guide. They’ll learn about an edible plant that is native to each country and get a stamp from a cast member at each Kidcot stop in World Showcase. This is a nice free activity that I would have loved as a kid. A few years back Flower & Garden Festival began featuring “outdoor kitchens” which sell tasting-sized portions of food and beverages (yep, these are the Food & Wine booths “re-purposed” for the spring festival). This year there are 15 booths, and you’ll find kid-friendly options at many of the booths. Our favorite drink was the Frozen Violet Lemonade ($3.50) from The Pineapple Promenade near the entrance to World Showcase. You can actually order a non-alcoholic version of any of the “slushie” drinks at the outdoor kitchens, even if they aren’t shown on the menu. 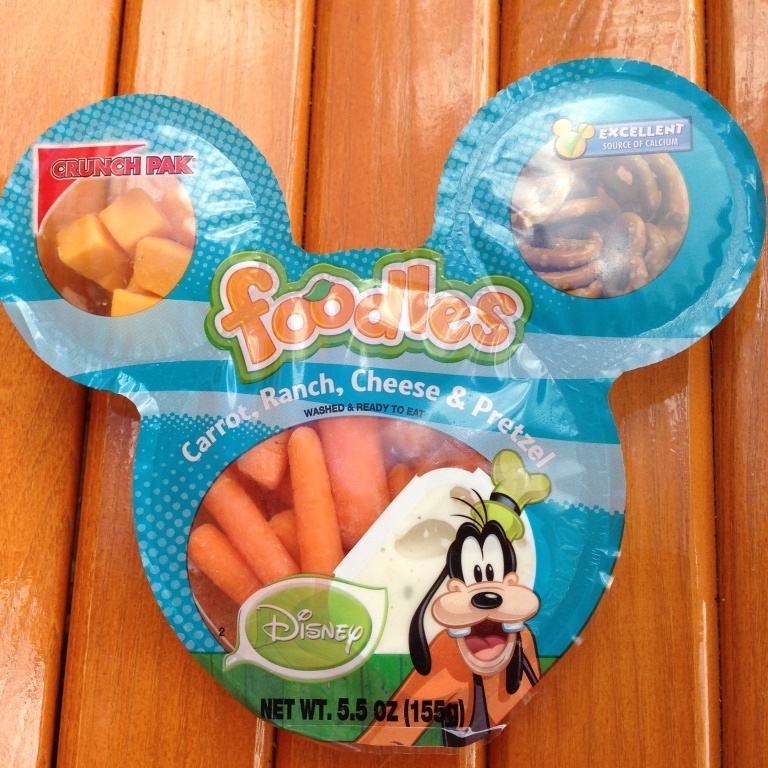 Also found at the Pineapple Promenade are “Foodles” ($3.75) which contain mini pretzels, cheese, carrots and ranch. It was a convenient way to get some nutrition to my daughter while I tried some more adventurous items. 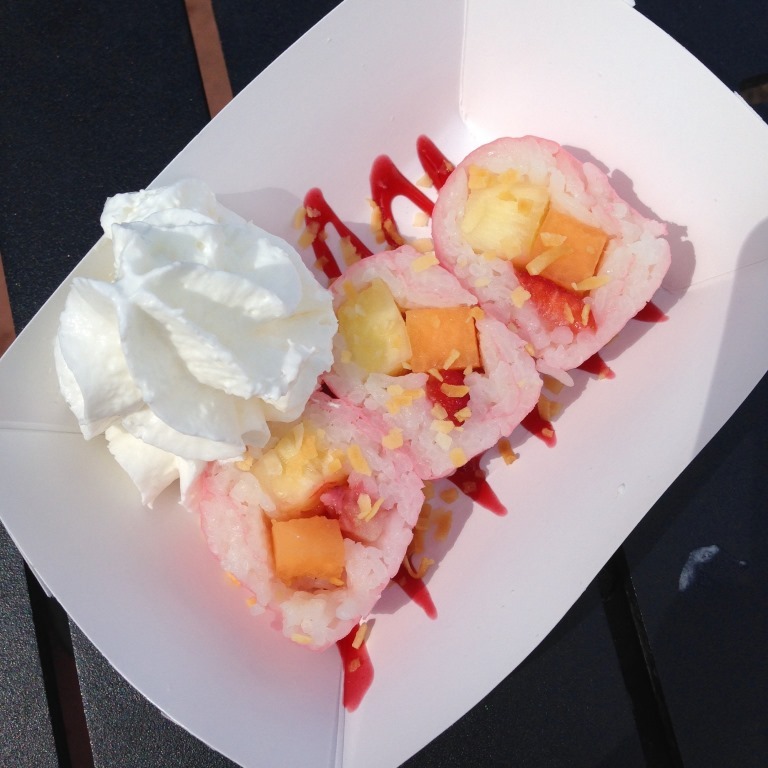 I think the “Frushi” ($5.75) found at the Japan booth would be a hit with most kiddos. The coconut rice and fresh fruit were really nice, though I only got to enjoy a few bites because my daughter gobbled them up. 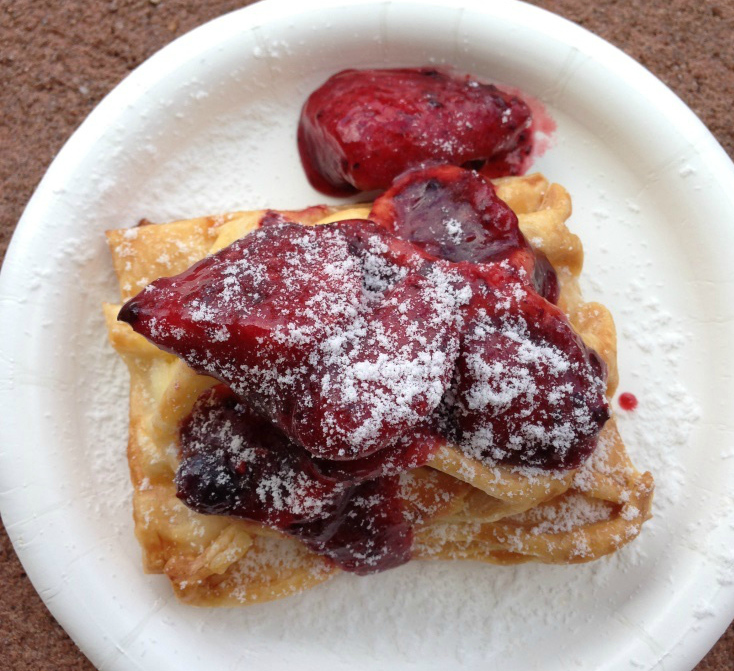 You’ll find lots of berry-inspired dishes at the festival, and we loved both the Field Greens with Strawberries ($4.75) from The Berry Basket and the Warm Cheese Strudel with Mixed Berries ($4.00) at the Bauernmarkt in Germany. We tried the Potato Pancakes with Applesauce at Bauernmarkt but it wasn’t to our liking. 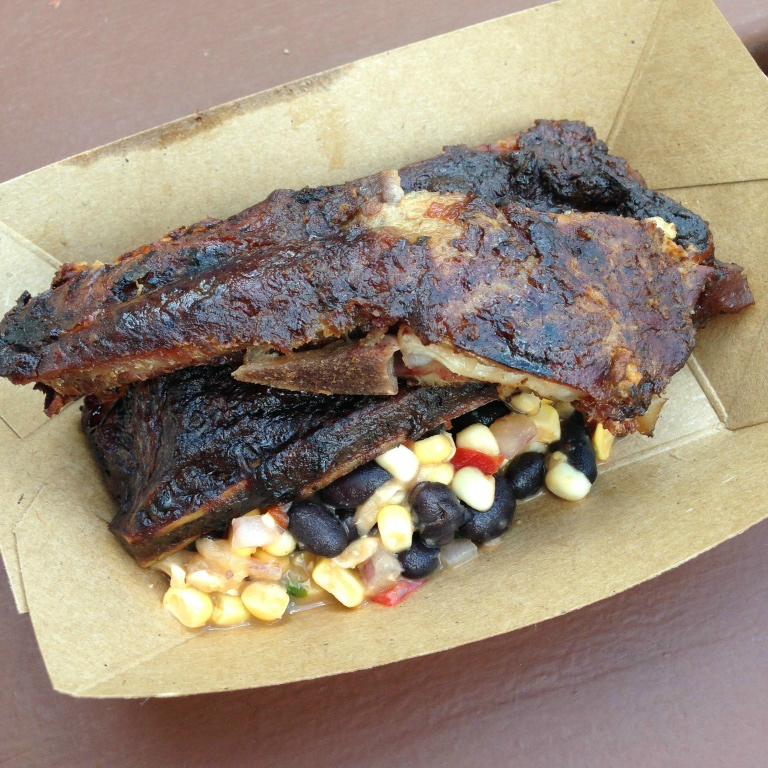 The Smoked Pork Ribs with Black Bean and Corn Salad ($6.75) from The Smokehouse in the American Adventure pavilion was another good option for kids. 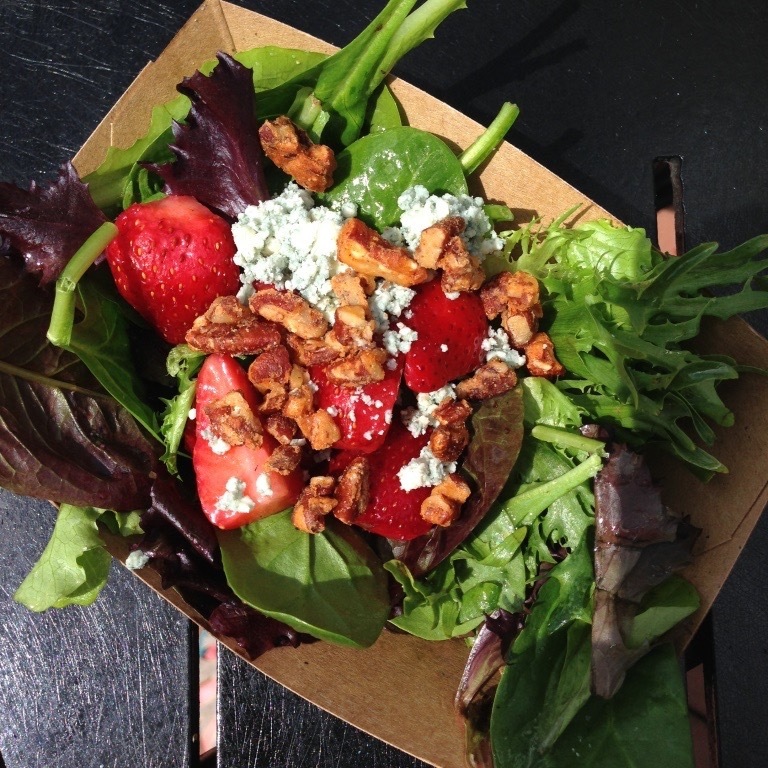 No overpowering flavors, though the salad did have a tiny kick to it. I suggest steering clear of the Pulled Pig Slider with Coleslaw, which was so spicy it made my eyes water! 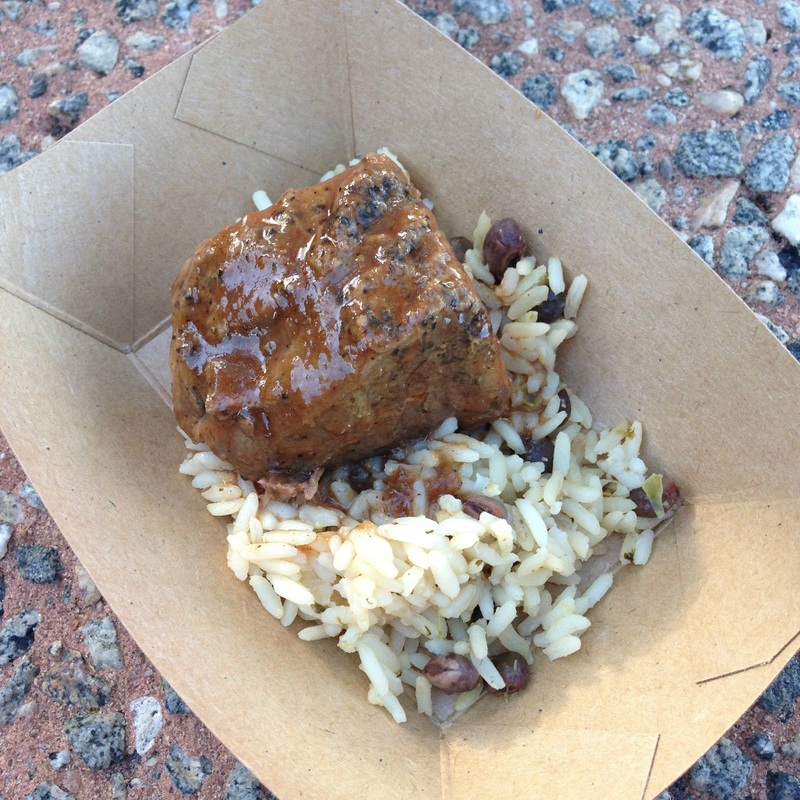 And last, a surprise hit was the Jamaican-Braised Beef with Pigeon Pea Rice ($6.00) from the Isla Fresca booth near the Mexico pavilion. It was super tender and flavorful without being spicy, perfect for little ones. 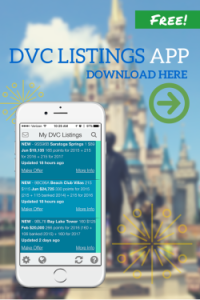 TIP: If you are on the Disney Dining Plan, you can use snack credits to purchase many of the items at the Outdoor Kitchens. You can get very good value from snack credits if you use them on the more expensive items at the booths. We found that, unlike Food & Wine, there were no long lines at the booths – even on a weekend during spring break. There are more than 70 topiaries at this year’s festival, including lots of favorite characters from Disney and Pixar movies. 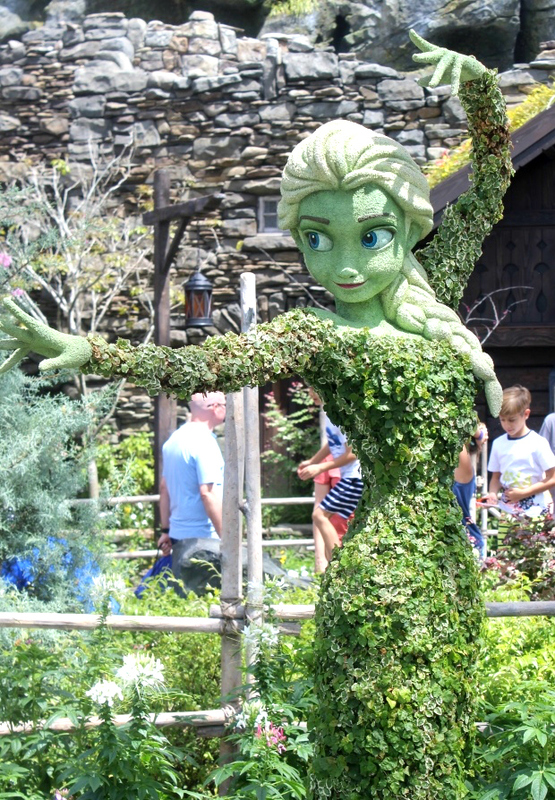 Some of the princesses have topiary facial features, such as Elsa, which make them look incredibly lifelike! 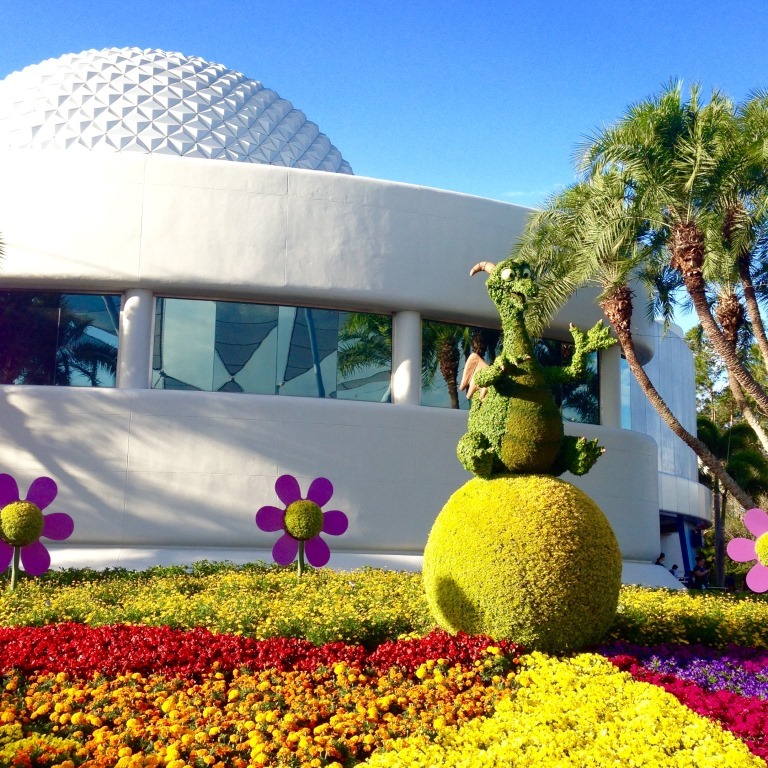 Figment looked fantastic behind Spaceship Earth. I’m so glad he appeared at the festival in topiary form this year. I think Tinkerbell and Peter Pan were my favorites, probably because of Peter Pan’s location (no hints – you’ll have to find him yourself). 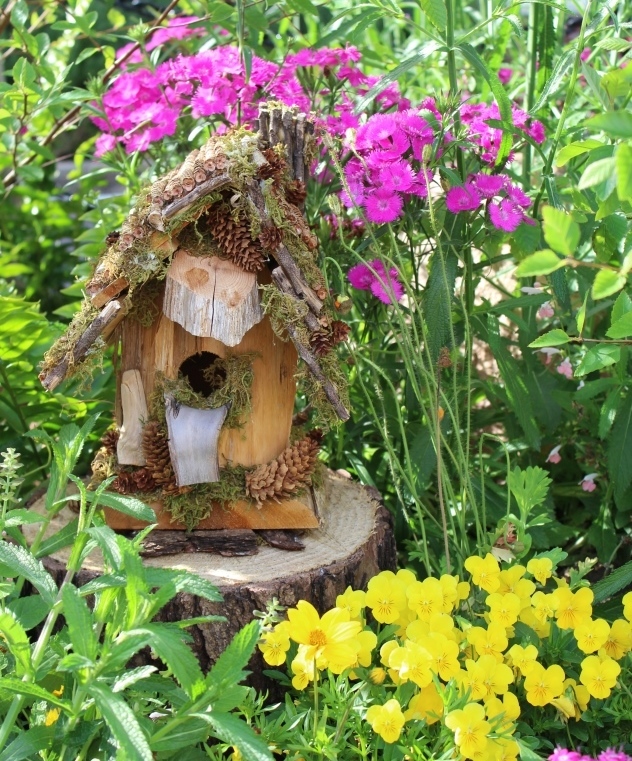 TIP: I have to mention that we both loved the adorable fairy houses that fill the garden surrounding Tinkerbell. 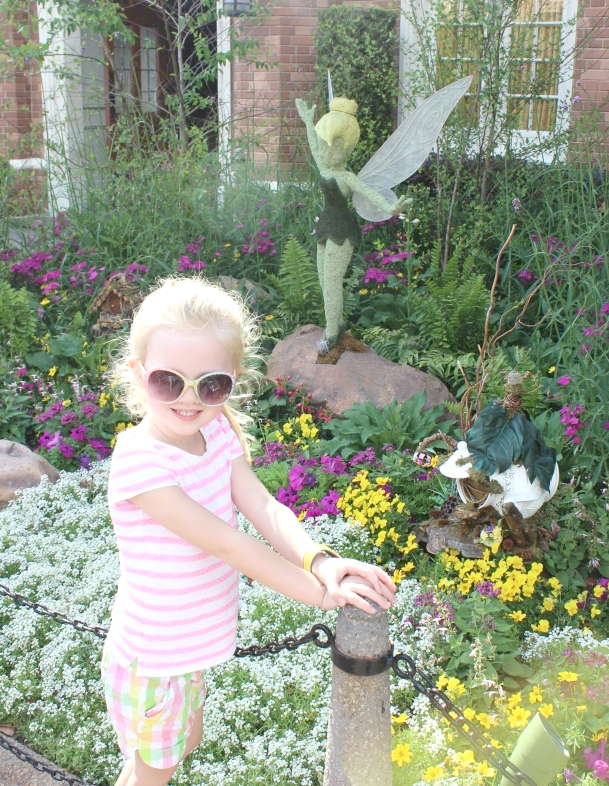 If you have any little ones into fairies, be sure to plan on spending some time checking them out. Be sure to grab a Garden Passport, which serves as a guide to the festival and a free souvenir. It containers stickers that you can use to mark which gardens and outdoor kitchens you have visited. My daughter completed ours after we got back home, which was a fun way to reflect on everything we saw at the festival. 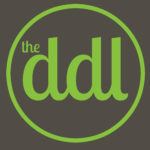 The Garden Rocks concert series features shows at 5:30, 6:45 and 8:00 pm every Friday through Monday during the festival. The kids likely won’t recognize the bands (which had hits in the 70’s through 90’s), but you’ll probably be able to sing along! The Festival Center is located in the old Wonders of Life pavilion and is open from 10:00 am to 5:00 Friday through Sunday. There isn’t much for kids there, but there are free presentations on gardening and crafts offered throughout the day. 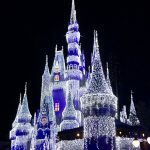 With all that the Flower & Garden Festival has to offer families, I would argue that it alone could be a reason to visit Walt Disney World. We spent the entire day enjoying all the festival had to offer and felt like we could have used more time! 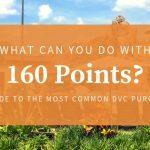 I hope this post helps you enjoy and make the most of your spring-time visit to Epcot.